Long Lost Blues was inspired by my passion for American roots music, a passion that in part inspired my move to the U.S. from England over a decade ago. 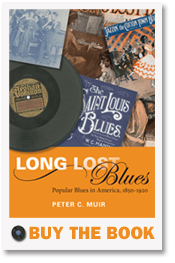 My research suggested that early commercial blues was of great significance, a vitally important missing link in the evolution not only of blues itself, but also surrounding styles like jazz and popular song. Besides which, so much of it was great music! Yet despite this, the genre had been almost totally neglected by scholarship. This book is a first step in remedying this situation, and will, I hope, bring wider attention to a genre of profound historical and musical importance.